Respiratory distress syndrome, or RDS, in premature babies is one of the more common health problems caused by being born early. Immature lungs are the culprit in RDS, which causes difficulty breathing. The working parts of the lungs are the alveoli, tiny sacs in the lungs that inflate with air when we breathe. Alveoli are covered with tiny blood vessels that carry oxygen from the air we breathe to the rest of the body. In premature babies, the alveoli don’t always work as well as they should. A chemical called surfactant usually keeps the alveoli open so that they fill easily with air and work efficiently. Babies don't have enough surfactant to keep their alveoli open until they are close to term. When the alveoli don't have enough surfactant, they collapse, and gas exchange cannot occur. 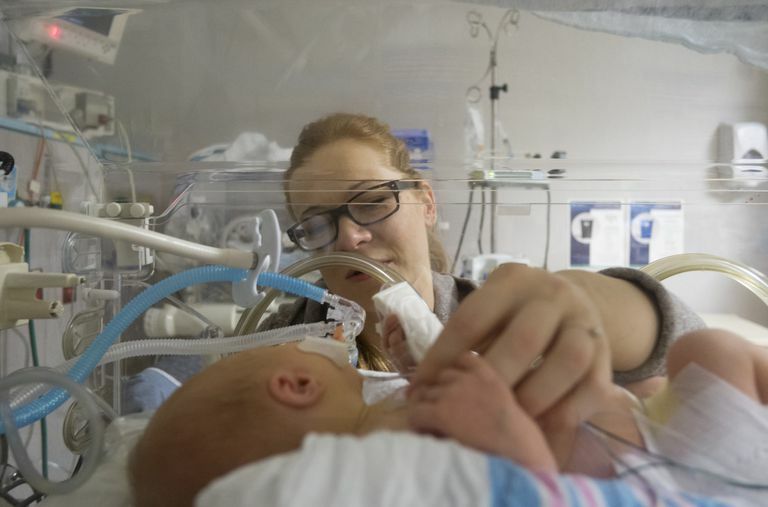 The lungs don’t start to make surfactant until later in pregnancy, though, so preemies aren’t able to keep their alveoli open as well as full-term babies. They have to work very hard to fill their alveoli when they breathe and don’t get enough oxygen to their bodies. This condition is called respiratory distress syndrome, or RDS. To avoid this issue, doctors will often give very premature babies one or more doses of synthetic surfactant. Babies with RDS will have difficulty breathing. They may flare their nostrils when they breathe, breathe very fast (called tachypnea), look pale or slightly bluish-gray, make grunting or sighing sounds when they breathe or breathe so hard that you can see their ribs when they inhale. To diagnose RDS, doctors may use one or more of several tests including a chest x-ray, a blood gas analysis, and/or a blood test to rule out infection or other issues. Time: A baby with mild RDS may receive no special treatment other than close monitoring for the first few days of life until the lungs start to make surfactant. Respiratory support: Babies with moderate to severe RDS may need help breathing or oxygenating their blood. Respiratory support often comes in the form of a nasal cannula, continuous positive airway pressure (CPAP), or mechanical ventilation. Artificial surfactant: Babies with severe RDS can be given surfactant directly into their lungs, to help the lungs stay inflated while they mature. If premature delivery is unavoidable but not imminent, then steroids are given to the mother before delivery can help a baby’s lungs to produce surfactant. Steroids work best when they are given between 24 hours and 7 days before birth, so they’re not useful in every pregnancy. Crowley MRCOG, FRCPI, Patricia A. “Antenatal corticosteroid therapy: A meta-analysis of the randomized trials, 1972 to 1994.” American Journal of Obstetrics and Gynecology. July 1995 173: 322-334. Sears MD, William, Sears MD, Robert, Sears MD, James, Sears RN, Martha. The Premature Baby Book: Everything You Need to Know About Your Premature Baby from Birth to Age One. Little, Brown and Co., New York, 2004.